Andy Raymond demonstrates the Armatix iP1, a .22-caliber smart gun that has a safety interlock, at Engage Armaments in Rockville, Md., last year. The notion of a gun smart enough to tell who&apos;s holding it isn&apos;t new. Several manufacturers have tried to introduce Americans to the concept, but the market here has been less than friendly over concerns that they are unreliable and would lead to more gun control. Supporters now hope that President Obama&apos;s new executive actions could turn things around. In a series of measures aimed at reducing gun violence, Obama directed the Departments of Defense, Justice and Homeland Security to "conduct or sponsor research into gun safety technology that would reduce the frequency of accidental discharge or unauthorized use of firearms, and improve the tracing of lost or stolen guns." In an address at the White House on Tuesday, Obama added: "If we can set it up so you can&apos;t unlock your phone unless you&apos;ve got the right fingerprint, why can&apos;t we do the same thing for our guns? If there&apos;s an app that can help us find a missing tablet ... there&apos;s no reason we can&apos;t do it with a stolen gun. If a child can&apos;t open a bottle of aspirin, we should make sure that they can&apos;t pull a trigger on a gun." But to Stephen Teret, longtime proponent of smarter guns and founder of the Johns Hopkins Center for Gun Policy and Research, this could be the key element: Obama also directs the agencies to "explore potential ways to further" the use and development of smart gun technology as well as consult with other agencies that buy firearms to see if smart guns could be considered for acquisition and "consistent with operational needs." Teret says smart, or personalized, guns have faced a stalemated kind of supply-demand: Manufacturers best-positioned to make and market these new guns don&apos;t want to go all-in on the idea without a reassurance of big orders, while no big buyer would put in such an order for an unestablished technology. In simplest terms, if federal law enforcement and the military start buying lots of smart guns — and that&apos;s a big if — Teret thinks it would be just the incentive that manufacturers, venture capitalists and other investors need to consider such guns as a viable product. "What today represents is blowing up the logjam that has been keeping us from moving forward," Teret says. The impasse has a long history. A 2013 report from the Justice Department, solicited earlier by Obama, listed numerous corporate and research projects in the U.S., Europe and Australia that tried to develop smarter gun technology, including from established gun-makers like Colt&apos;s Manufacturing and Smith & Wesson. Many of the projects fizzled out, facing numerous reservations both from gun proponents and from opponents. Will It Make Us Safer? One of the biggest concerns from law enforcement officers cited by that 2013 DOJ report was reliability — the concern that a battery-powered or computer-chip-driven gun wouldn&apos;t fire when it should. 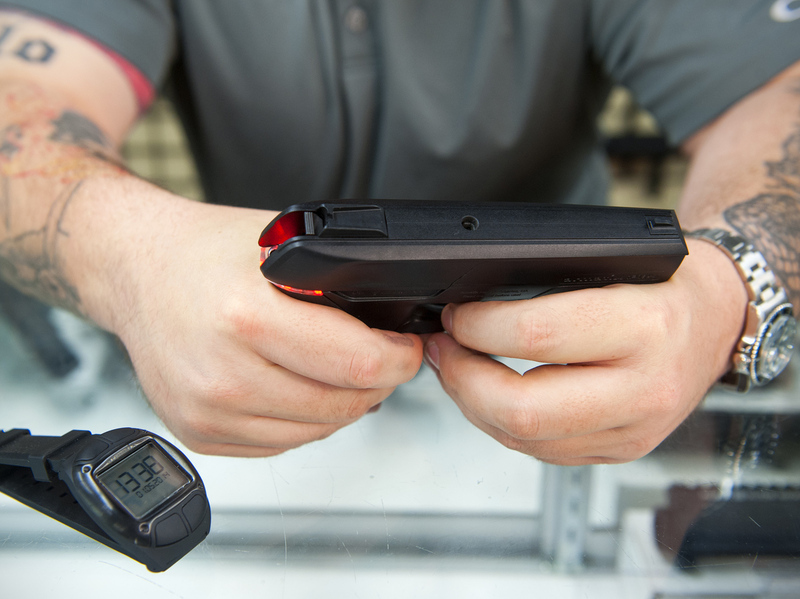 The National Shooting Sports Foundation, the main firearms industry trade association, in a statement, says it has never opposed development of smart gun technology. "How additional government research into this technology would advance it is unclear," the group says. And the industry&apos;s big worry is that support for smart gun technology would turn into a mandate that all guns need to be smart. In fact, New Jersey&apos;s 2002 "Childproof Handgun Law" has spurred much of the outcry over attempts to sell smart guns in the U.S., because it said that once "personalized handguns are available" anywhere in the country, all handguns sold in New Jersey must be smart guns within 30 months." The National Shooting Sports Foundation also says there are "well-proven existing methods to secure firearms" and that firearm accidents are at an all-time low. The National Rifle Association, in its statement criticizing Obama&apos;s executive actions, didn&apos;t comment on smart guns specifically but generally argued that the presidential action would not have prevented recent mass shootings. The Violence Policy Center, which advocates for gun control, also has no specific position on personalized guns but has argued that research dollars would be better spent on things that prevent gun violence, like better injury and death measurements, youth programs and public education about risks. Spokesman Avery Palmer referred NPR to the group&apos;s 2013 fact sheet on smart guns, which runs through a variety of reservations about their effectiveness, including the possibility that it may attract more, not fewer, people to gun ownership. The fact sheet also says the group opposes the use of any federal tax dollars in support of smart gun research. Asked whether that meant the group also opposed Obama&apos;s smart gun initiative, Palmer said the center didn&apos;t yet have enough detail on the proposal to determine the group&apos;s position. Teret at Johns Hopkins says that firearm accidents have indeed been declining and smart guns aren&apos;t a panacea to gun violence. He compares his current advocacy to his earlier work to get air bags installed in cars, despite concerns about their risk and effectiveness. "No one can tell you with any level of certainty how many of the 33,000-plus [annual] gun deaths will be avoided by personalized guns," he says. "But I certainly have absolute confidence that it will be enough deaths that will be avoided that makes this worth it."